Oh! Where do I Sleep Today! 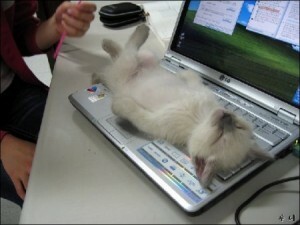 I seems that our feline friends just like to sleep anywhere in comfort, including on top of your computer. It is a know fact that Cat sleep between 14 to 16 hours a day. The rest of their time the a playing with mice, grooming themselves and hunting for whatever they can catch. Lets talk about sleeping. In trees, on the grass laying on their back, on you head, squeezed under the covers next to you where you can’t move, under the bed, on the couch, high places in the kitchen cabinets and just about everywhere in you home. The best New Years present you can find for them is the new designer cat tree which looks, tastes and feels like a real outdoor tree they are used to sleeping in the mid afternoon. You can see them at Cat Place USA under designer cat trees.